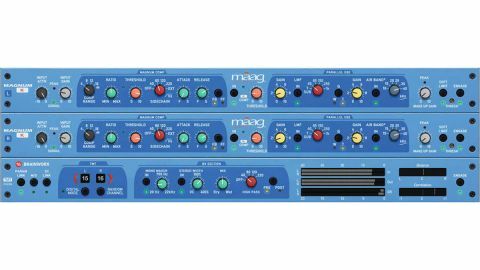 The miracle of software emulation gives every producer the chance to get their hands on Mäag’s incredible channel strip. K Comp works a treat. Magnum Comp is super clean, and its Range control is useful . EQ2’s Air Band is always a winner. No bypass for Magnum Comp or EQ2. 2017 at last saw the integration of that circuitry - which was given the name K Comp - into a dedicated device, to which was added a further broadband compressor with a Range control (quite a rarity), and a slightly tweaked Mäag EQ2 module, with its famous Air Band for high frequency shelving all the way up to 40kHz. The EQ2 section houses two boost-only EQ bands and runs in parallel to the serial compressors, so it can be applied on its own or employed as a ‘sculpted’ make-up gain for the compressed signal. The Low Mid Frequency (LMF) peaking band works in either of two discrete bell-width modes: Tight or Wide. Each mode has its own set of five fixed frequency detents - between them covering 40Hz-1.4kHz, plus a 10Hz Sub band - and up to 15dB of gain is on tap in Wide mode, while Tight mode’s more focused peak maxes out at +12dB.